I write in a corner of our bedroom, four floors up. Light comes in from a window to the left of this photo. We overlook a schoolyard, so I work accompanied by the almost-constant screaming of young children. On good days this is not a problem. 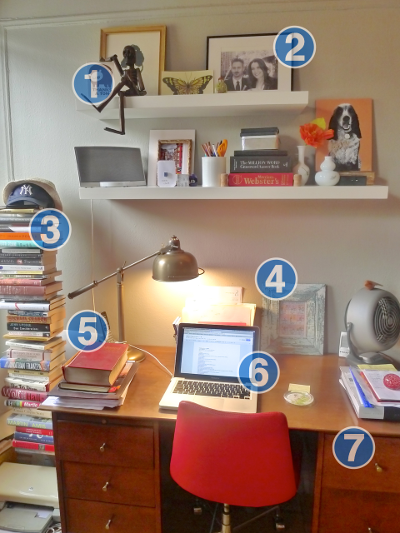 Here’s a brief annotated tour of my work space. (1) A wooden calaca (skeleton) from Tulum, Mexico. He moves around a bit, sometimes hanging out on the book pile or elsewhere on the shelves. As you can see, he’s incredibly easygoing. Possibly due to his lack of spleen. (2) Wedding photo, 2007. My hair looks so vertical it would appear I believed myself still in with a chance of becoming a Premiership footballer. At the age of 35. Six years later, I’m not quite so foolish. It is only international cricket I now harbour dreams of playing. (3) Looks like a stack of books but is actually an ingeniously designed bookshelf. Includes the excellent ‘150 not out: The Complete History of Rainham Cricket Club 1856-2006’ a book in which I am recorded as co-holder of the record eighth wicket partnership (79, v. Gore Court, 1990*). Who’s laughing at my international cricket dreams now? (4) My favourite ever cartoon about novelists, you can see it here. Only one of these panels does not apply to me. I’m not saying which. (5) Chambers Dictionary, the best dictionary in the world. I have an old 1990 edition which is now falling apart. How could you fail to love a dictionary that includes lexicographical jokes? For example, ‘éclair: a cake, long in shape but short in duration’; ‘noose: snare or bond generally, esp. hanging or marriage’; ‘kazoo: a would-be musical instrument’. Also, it’s very important to use a real dictionary, rather than a computer program or the internet, because one of the joys of leafing through the actual pages of a dictionary is coming across surprising and interesting words you’ve never encountered before. (6) My computer, a MacBook Pro. I aim to write 400-500 words per day on here. When things are going badly I might leave my apartment and head to the park with dog, pen and paper. Pen and paper can also be good for editing (dog less so). If you’re ever struggling with an edit try this – don’t just hack away at the text on your screen. Instead, look at your screen but write the scene out afresh on a piece of paper, changing things as you go. I’ve found this little trick often works well. (7) My desk. This was designed by Paul McCobb, part of his Planner Group. Probably from the 1950s. A vintage desk is a great pleasure to work at – and I need something old and becalming to counterbalance the youthful screams of joy from the schoolyard next-door.